Stage 5: Home is Wherever The Sox Are Playing « It's a Kind of a Family. It's a Kind of Insanity. Stage 5 is the stage where you move away from New England and Fenway, lucky to see the place even once a year, yet still impart the fandom to your kids…and, in my case at least, wife. This is the stage that a large number of the 40,000 fans at Saturday night’s game in Baltimore come from….and my sister’s family in Allentown, Pennsylvania….and of course, me. We highlight the days on our calendars when the Red Sox will be playing at a stadium within driving distance…we travel five hours with our small children to see the Sox play an exhibition game?..we teach our kids that the blue hat with the red "B" (and, of course, the red hats with the B and the green hats with the B and the pink hats with the B) is the one we root for, despite being surrounded by "W" hats or O’s hats or, in many cases, the dreaded interlocking NY. We miss work (don’t just go in late) to fly around the country to see the Sox play in the postseason. We read the Globe and Herald every day online….even in January. And when we read the Globe, we wish Peter Gammons would go back to doing what he does best, the Sunday notes, and stop his ESPN gig. 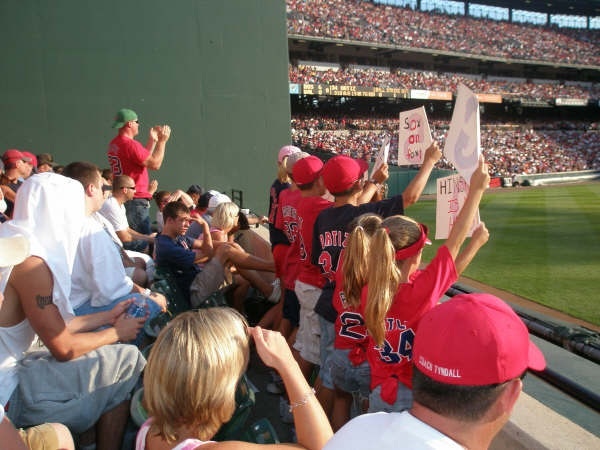 We teach our kids to sing "root root root for the RED SOX" during Take Me Out to the Ballgame. We cover the walls of our basements with pictures of Fenway, and old timers in Red Sox hats (in my case it’s autographed photos of Ellis Burks and the immortal Butch Hobson). We hang Red Sox/Fenway stuff in our offices…prominently. We stand out as Red Sox fans. Fenway Park is a place we only see on our TVs (many people in RSN, in this stage of fandom, panicked when it appeared that DirecTV would be the sole carrier of MLB extra innings) and hear through our radios (thank you, MLB.com!). Our Red Sox experiences these days are in far away ballparks. With that in mind, we revel in walking around a visiting ballpark and seeing the people who make up Red Sox Nation, and of course their Red Sox paraphernalia (evidence that there really is an article of clothing out there for everyone). With a mix of amusement and pride, we laugh as the home fans get increasingly annoyed as they look around and see themselves surrounded…and drowned out…by Red Sox fans. We giddily discuss the vagaries of this year’s squad with our neighbors in the stands…because we can. Where I work, nobody cares about whether Dustin Pedroia is leading off or hitting second. But these people do. My neighbors don’t care that Francona went with Delcarmen instead of Okajima in the eighth inning in a game RSN at Camden Yards the previous week…but these people do. It’s our cross to bear and our badge of honor to overanalyze every minute detail of the team. Perhaps more than anything, we get goosebumps when we hear a non-Fenway stadium rise up in chorus, "Let’s go Red Sox" (and are pleased to note the beautifully harsh Boston accent…"Sawx" instead of "Sox"). "I have good friends who are still in New England, and of course I am jealous of them when they go to Fenway. But I also love calling them when I am in a ballpark somewhere else and I know they’re back home watching on TV — jealous of me. And I tell them that there is no way to fully understand the power of Red Sox Nation until you’ve seen it in another ballpark. It is one of the most amazing things I’ve experienced, and it is probably the thing that makes me proudest of where I grew up. It really is an identity. To be honest, I look forward to getting the schedule each year now because I see it as an opportunity to visit a new place, using the Sox as my excuse. Because no matter what city you are in, if the Red Sox are in town, it feels like home.? "I sometimes watch the Red Sox players in other ballparks and wonder how they view this, if they ever talk about it with each other. Even more, I watch FORMER Red Sox players who are now on the other side…a guy like Millar with the Orioles…and I wonder if they have more of an appreciation of their days in a Sox uniform. It really is a traveling carnival. As an Oriole, Millar will play the Blue Jays or the Devil Rays in front of about 10,000 fans. When he was a member of the Red Sox, every game in every stadium was a sellout…and most of the people were there to see him and his teammates. What an amazing thing!" GREAT description of this stage of fandom! We rely on redsox.com/gameday and WTIC Hartford from 200+ miles away–only comes in when the sun goes down (and has FOOTBALL games on September/October weekends–SO ANNOYING!!!). Our kids find instant friends when they spot a Boston cap…. I would have to agree with Rob, Ben is the greatest Red Sox fan that I know well…or perhaps…just the greatest fan period. The truth is, though, that the Crawford family is undoubtedly the greatest family of Red Sox fans. I met Ben in graduate school in Texas of all places. 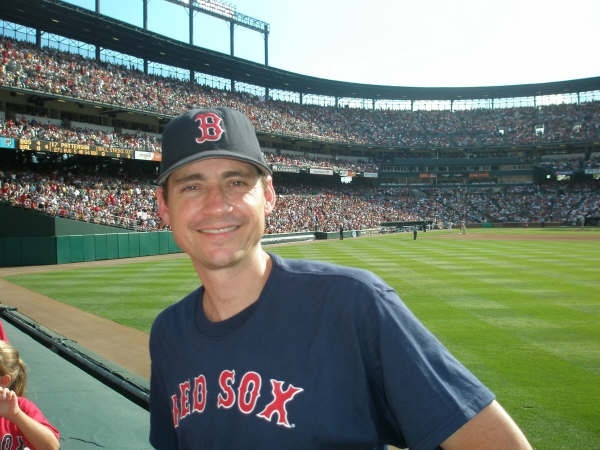 If Red Sox Nation is looking for a President who properly represents the dignified and infectious pride that makes people all over our nation and indeed our world (I live in Uganda) come to believe that there is something magical about baseball, then Rob is your man. After two (too short) years as Ben Crawford’s roommate, I can’t help myself from tracking the Sox. This despite never having been to Fenway, growing up in the midwest, and only spending a mere couple of weeks of my life in Boston. This “regular” family of Sox fans is the most sincere, intelligent, classy, fun-(read Red Sox)-loving, and caring that I know. I’d vote for Ben to President of The United States. Undoubtedly…Regular Rob deserves to represent Red Sox Nation and the greatest family of Red Sox fans as the first President of Red Sox Nation. Go Regular Rob!!! !